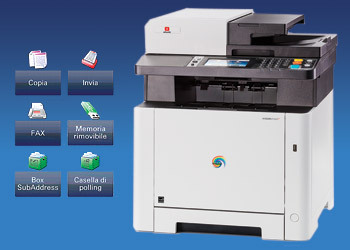 The Olivetti d-Color MF2624 and d-Color MF2624plus A4 colour multifunctional systems, with their compact modern design, represent the ideal solution for work environments where space is limited but demands for good performance, professional results and reliability remain high. 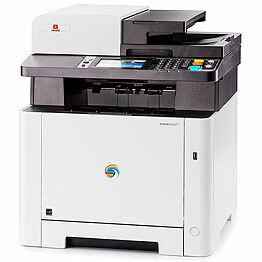 The 4.3" touch panel and programmable keys are intuitive to use, while the dual scan automatic feeder for single-pass duplex scanning improves work throughput resulting in increased productivity. The bypass and paper trays (with a 550 sheet maximum capacity) provide the ideal handling of mid-volume workloads and enables documents to be produced on different types of paper media. The toner utilises a new technology which is able to amplify colour and vibrancy giving images an excellent quality. 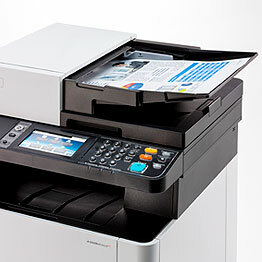 The standard Wi-Fi and Wi-Fi Direct interfaces (only for d-Color MF2624plus) and compatibility with AirPrint and Olivetti Mobile Print protocols enable these machines to respond to the growing demands of businesses “on the move”. Low emissions, low energy consumption, long-life components, minimum noise and recycled materials all make for an impressively low environmental impact. Weight Base unit: 26 kg approx. Power Consumption, Sleep mode 1 W approx. Security Standards GS, TÜV, EC. This product is manufactured by a company operating in conformity with ISO 9001 quality standards and ISO 14001 environmental directives. RoHs compatibility. 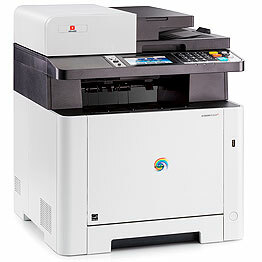 Initial supply toner 1,200 pages.